The three old men were a fixture on the South Brazos Santiago jetties. They had an old red oilskin tarp set up as a sort of lean-to for shade, a banged up Coleman camp stove with a pot of coffee and black-scorched cookwear. They had a bucket and castnet nearby, an old cutting board and knife, and the pre-requisite tackleboxes. In five rod holders spread over a couple of hundred feet were four long, thick hand-wrapped poles made from Calcutta cane with huge Penn 116 Senators battened to each. Thick Dacron line stretched out from the reels and out into the deep water on the channel side of the jetties. They were shark fishermen. There is no denying that the very idea of fishing for sharks has always had an allure to a certain cross section of anglers. Alf Dean’s 2,644 pound Great White that he caught out of the waters around Australia in 1959 still ranks as the largest world record ever recognized. The mount, which hangs at the International Game Fish Association Museum in Dania Beach, Florida is an awesome sight. Sharks are the monsters we fear, the creatures we marvel at, and the stuff of legends. Of course they have chewed a niche into our psych. Not all big game fishing is done from a boat, and not all big game fishermen own a boat. Sometimes factors such as finances, living situation or logistics can proscribe ownership of or access to a boat suitable to the needs of an angler who has aspirations of latching into Ol’ Mean and Nasty. A seaworthy, properly outfitted vessel suitable for going after even bay sharks can cost a pretty penny, as well as the cost of fuel, storage, upkeep, and various other expenses. Still, the shark is an accessible quarry for the ambitious fisherman who is willing to dig his heels into the sand and shells of a local beach or along a sea wall or jetty. In fact, some real monsters can be pulled out of the breakers long South Padre Island, Matagorda Island, Galveston Island, and Sabine Pass. 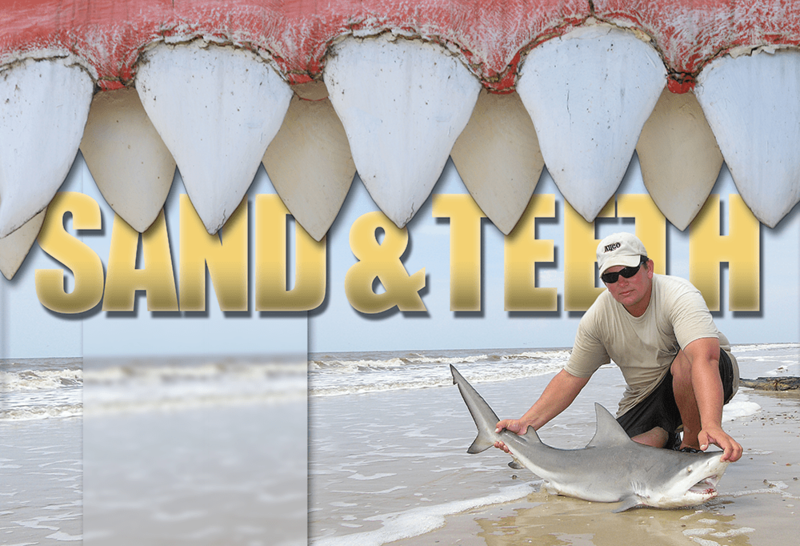 The vast jetty system in Galveston is a legendary for some of the giant sharks caught there. Roy’s Bait and Tackle in Corpus Christi still sports a photo of a 1200 pound tiger shark that was pulled from the National Seashore. Baltazar’s first run in with a surf-bound shark was when he was 11 and a small hammerhead grabbed a mullet head reserved for the bull redfish that roam around the Mansfield Pass jetty on the South Padre Island side. It wasn’t a big shark, maybe 3 feet long (“but plenty big for a skinny kid like me”), but Baltazar was hooked from point on. “Sharks became my obsession,” said Baltazar. TF&G Reader Brandon Jeffcoats caught this 5-1/2 foot blacktip at Sargent. In the 20 years since that run-in with the mischievous hammerhead, Baltazar has fished for sharks on beaches and jetties from Boca Chica to Sabine and has spent time learning and refining techniques that he’s picked up catching tigers, bulls, lemons, hammerheads and sand sharks upwards to 12 feet long. The surf shark fisherman has a different set of needs than a boat-fisherman. The immediate need is to get a bait out past the second and third bars, where the bigger sharks tend to prowl (though they will also come into the wade gut during high tides). A very close second on the priority list is having tackle that can handle most any shark that picks up the bait. Long rods measuring upwards to 13 or even 15 feet with large offshore-style reels filled with at least 50 pound test line are almost mandatory. Baltazar’s rods of choice are almost old-school: long fiberglass blanks that he wraps himself matched with Penn Senator 114 and 116 reels loaded with 65 pound Ande monofilament (he has considered replacing the line with similar-test braid, which would facilitate even higher line capacity, “but I can’t talk myself into spending all that money”). Baltazar prefers his Senators over other reels because of the simplicity of the design. He concedes that the lever drag design of an International or Shimano or Avet reel would provide more torque and leverage when fighting a big shark than the Senator’s star drag design, but the Senators are easier to clean of sand and grit, the banes of the surf shark fisherman. The long rods hold the line above the waves for a greater distance, which helps Baltazar keep the bait from being pulled and rolled by the waves. They also provide leverage when fighting a shark over 300 yards out. In order to get the bait out to where the monsters prowl, Baltazar and his fishing partners use a kayak to scull out past the breakers. They drop the bait, which can be a large skipjack, horse mullet, small jack, or—if no other bait is available—a large whiting past the last sand bar and pull back to shore and repeat until all their baits are out. Time spent fishing for sharks from shore is slow time. Baltazar has waited upwards to 8 hours or longer between bites. There is a temptation to reel in and check to see if there is still bait on the hook, but Baltazar has developed the patience needed to keep his hands off the reel handle. The wait time lends itself—and even recommends—other pursuits. Baltazar’s wife, Sarita, and his 2 daughters have become regular companions on his excursions up and down the South Padre Island surf and he’ll spend the time waiting for the bite alarm to buzz by playing with his family. When a shark picks up the bait and runs, however, the entire family turns to the business at hand. 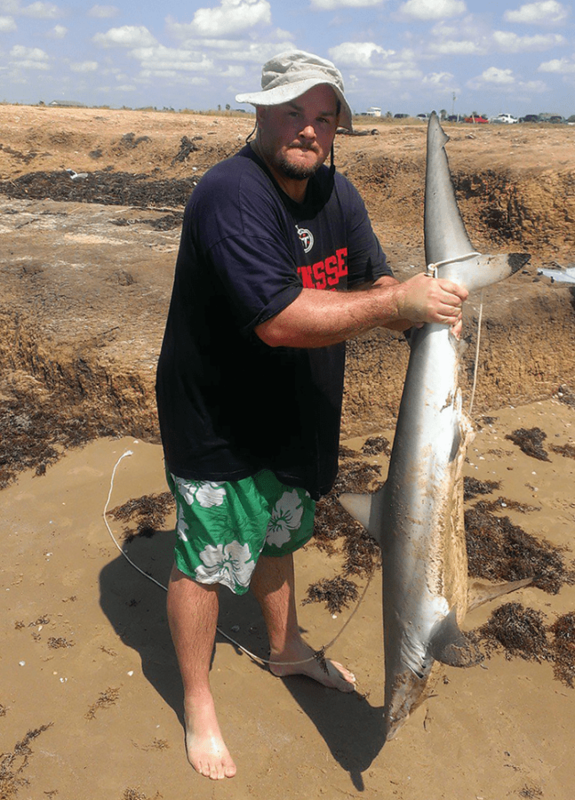 The old men that used to fish the Brazos Santiago jetties were shark hunters. They took home what they caught. Baltazar may occasionally keep a small blacktip or lemon shark for grill steaks, but like many of the current generation of shark fishermen, he releases the true giants. Gotta feed that obsession, you know?